Rush hour just got a lot more interesting. Imagine waiting for a train in a packed station when suddenly a mob of shirtless Spartans in full gear run past you. Yes, exactly like the ones in 300: Rise Of an Empire. 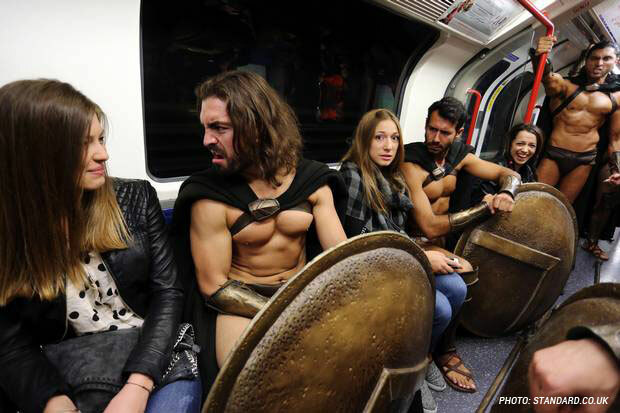 This was the scene in London’s Tube last September 2014, where commuters were treated to an eyeful of six-packs storming into trains. Some ladies were even lucky enough to get up close and personal with some of the Spartans. Never mind that they were growling and making funny faces. The stunt was a promo for the Blu-Ray release of the movie. Kudos to the team behind it, because we’re pretty sure it was very effective. ICYMI, here's the trailer for the movie.